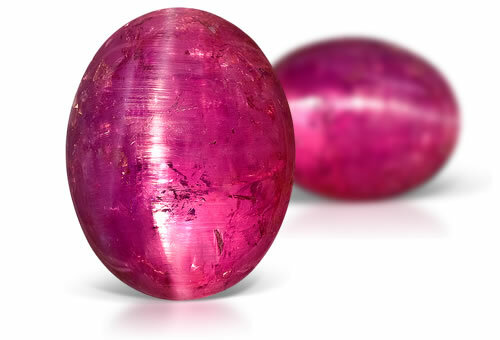 Displaying gorgeous deep raspberry pinks, pezzottaite is a relatively new gemstone that has been subject to much confusion due to its similarities with red beryl. Pezzottaite has a variety of trade names including Madagascan raspberyl, raspberyl and raspberry beryl. While pezzottaite is a member of the beryl group, due to its crystal structure and its cesium and lithium contents, it is a separate mineral species from beryl, making its trade names misleading. refractive index, birefringence, optic character and spectrum. Might show strain under the polariscope. Pezzottaite is not actually a beryl variety, but so closely related that it is sometimes associated with the beryl species. Originally, it was thought of as a cesium-rich form of beryl, but now is generally considered a separate species. Misnomers: hot pink red beryl, raspberyl or red beryl. Often seen as cat's-eye. Pezzottaite is a Type III clarity stone. The stones frequently have liquid inclusions, fingerprints, growth tubes. If the stone has numerous growth tubes it can be chatoyant.